During those long summer evenings, what could be better than to take dinner in the dining room, or sip a cocktail on the terrace and watch the sun set over the bay while live music plays in the background. Every Tuesday in summer, you have live music between 6.45pm and 9.00pm. Enjoy the varying sounds of keyboard, harp, flute or saxophone with the Sterry family. 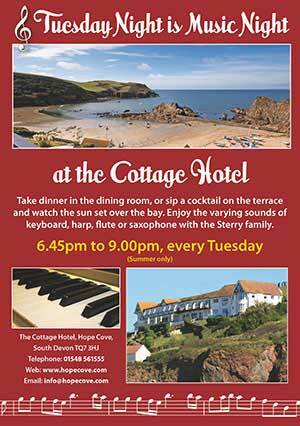 Contact the Cottage Hotel to find out when the Music Nights are running.